Art related Prezi presentation template. A colorful spray paint can on an abandoned warehouse background, with walls covered with graffiti. Talk about modern or abstract art, street art and 3D painting. 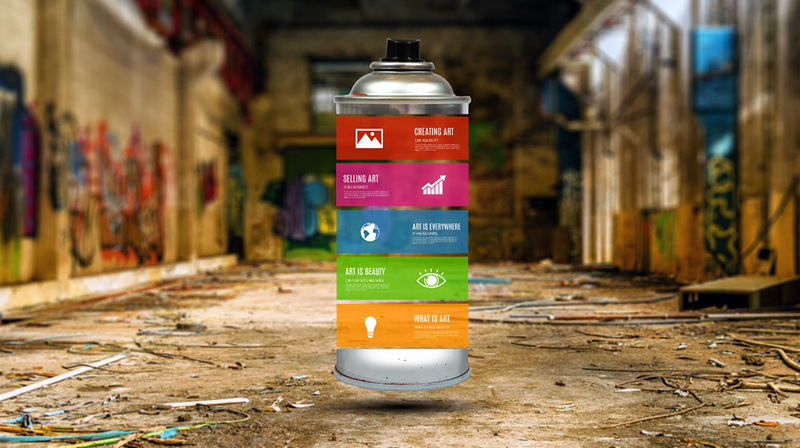 Present about guerilla marketing, where creative things are created on the streets. Make a presentation about art lessons, graffiti artists, graffiti problems, urban street art. This entry was posted in Best Prezi presentation templates and tagged 3-d, 3d, about, abstract, abstract art, abstract presentation templates, abstract presentation video, abstract Prezi template, an, art class, art lesson template, art lessons ', art presentation template, decorate, graffiti, graffiti art presentation, learn art, paint can, paint on wall, painting, presentation templat art, prezi template, prezi templates, spray, spray painting, street 3d artart modern art prezi, street art, street painting, teach art, warehouse.